Remember dial up phones? The rotary dial telephone was patented in 1879. It was in commercial use by the early 1900's. In 1950 the dial changed from metal to plastic. Around this time the new touch tone pads were taking over. By the '70's the rotary dial was on its way out. I found a couple still in use! Yes I remeber these phones. You never wanted to dial an overseas no. too long. Nicely done and nostalgic too. Honestly? They're still in use? Cool! I haven't seen a rotary dial phone in years! Happy theme day! I looked at the enlargement and saw a lot going on in there, a guy working in the background, a level propped up on the left. It looks like a busy place. I'm completely amazed to see that these rotary phones are still in use. I didn't think they were compatible with new systems. Cool! nice! I love the sound the rotary dial makes... but also remember how long it took to phone someone if they had several 7,8,or 9's in their number! 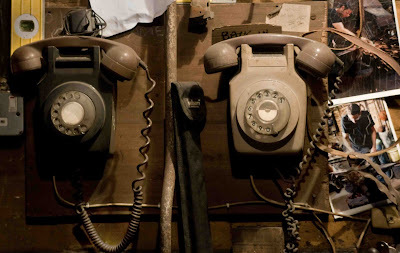 This photo reminds me of the phones I saw inside the Cabinet War Rooms! Lovely phones! My parents still have one! It has a wonderful sound! driiiiinnn! What a great shot for theme day! You made a good choice. I do remember these phones - my grandma had a couple! I loved to play with them. Can't believe even now there are some in use. That's unbelievable that these phones are still in use! They just don't make products nowadays that will last like that anymore. Wonderful choice for Theme Day.